Dornford Yates, real name Cecil William Mercer, born 1885 at Walmer, Kent, resident Pau, France 1922-40, and Umtali, Rhodesia, from 1946 until his death in 1960. The son of a solicitor, 'Dornford Yates' attended Harrow School and University College, Oxford. The family moved from Kent to London when he joined Harrow as a 'day boarder' in 1899, his father selling his solicitor's practice in Kent and setting up office in Carey Street. After Harrow he went up to Oxford in 1904 where he was active in the Oxford University Dramatic Society, becoming Secretary in 1906 and President in 1907. He made many useful friends during his time at the OUDS including Oscar Asche, the producer of Kismet and writer of Chu, Chin, Chow. His 'third' at Oxford was not good enough to gain traditional access to the bar but his father used a little known 'back door' by getting Mercer a post in 1908 as pupil to a prominent solicitor, H. G. Muskett. Muskett appeared on behalf of the Police Commissioner and as his pupil, Mercer saw a geat deal of the seedier side of London life, much of which experience is evident in his books. During this period in London there was a major section of the criminal underworld of Jewish extraction and the sometime charge of 'anti-semitism' that is made against him as a result of many of his villains being Jewish is tempered by the fact that he was writing about what he knew. Mercer was called to the bar in 1909 and worked there for several years writing short stories in his spare time which were published in the Windsor magazine. After the outbreak of WW1 in 1914 he joined the County of London Yeomanry and was commissioned 2nd Lieutenant. The regiment left for Egypt in 1915 and in November 1915, as part of the 8th Mounted Brigade, he was sent to The Balkans where the war was in stalemate. Suffering severely from rheumatism he was sent home in 1917. Although still in uniform the War Office did not post him again and he was released from the army in 1919. The family home had been Elm Tree Road, St. John's Wood since 1914 and close neighbours and friends were Oscar Asche and his wife. A visitor to their home was a member of the cast of Chu, Chin, Chow, an American girl called Bettine (Athalia) Stokes Edwards, who was to become Mercer's first wife in 1919. Mercer decided not to return to the bar but to concentrate on writing. The couple stayed in the family home at Elm Tree Road and their son Richard was born in 1920. After WW1 there were a number of ex-officers in London who found that the rise in the cost of living precluded maintaining the style of a gentleman to which they had become accustomed and some looked beyond the boundaries of England. The Mercers moved to France where it was possible to live far more cheaply. They chose Pau, a resort in the Pyrenees where there was quite a large British colony, but the exact timing of their move is unknown. Smithers in his biography of Dornford Yates states "exactly how he hit upon the place is not clear" but Pau figures several times in the memoirs of Edward VII's motor engineer that he is presumed to have ghost-written for the author C. W. Stamper and so that may be the answer - anywhere good enough for King Edward VII was good enough for him. They rented the Villa Maryland. He was an exacting husband, Bettine was a social woman and by 1929 is was clear that the marriage was failing. Bettine had been less than discrete in her liaisons and Mercer sued for divorce. Bettine did not defend and in September 1933 the divorce was made absolute. In February 1934 Mercer married Doreen Elizabeth Lucie Bowie (Jill), the daughter of a London solicitor, whom he had met on a cruise in 1932. Villa Maryland had many 'Bettine' memories for Mercer and they decided to build a new house. They chose a spot 20 miles from Pau near Eaux Bonnes on the route to the Spanish frontier, the whole project being related in 'The House that Berry Built', the house 'Gracedieu' in that book being in reality called 'Cockade'. With the invasion of France in 1940 the Mercers arranged caretakers for Cockade and travelling through Spain and Portugal to South Africa and arrived in Salisbury, Rhodesia in 1941. He was re-commissioned in Royal Rhodesian Regiment and attained the rank of Major. As the war drew to a close their hoped for plan to return to Cockade was achieved but they were disappointed in both the state of the house and the attitude of their one-time servants. After some months they obtained exit visas and returned to Umtali, Rhodesia where Mercer was to spend the rest of his life. He supervised the building of a replacement for Cockade, another hillside venture, and they moved into ''Sacredown' in 1948. The furniture in France was shipped to Rhodesia as were the Waterloo Bridge ballusters, which had never actually reached Cockade but had been stored in England during WW2. Mercer continued writing although by this time more money was not a problem and he died in March, 1960. Mercer uses his knowledge of the English bar in his books as 'Berry' is a local magistrate and 'Boy', the narrator of the 'Berry' books, is a barrister. For those unfamiliar with his work his novels are set mainly in England and continental Europe starting at a time when the horse had not entirely been superceded by the internal combustion engine as the method of transport for a gentleman. His first book, The Brother of Daphne, was a collection of short stories originally published in the Windsor magazine and was published in 1914. 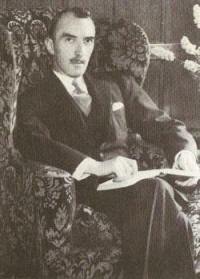 25 of his 34 books were written before the end of WW2. Whether or not based on fact, in his books a gentleman would rarely consider travelling in Europe without taking a pistol although he had little need for a passport. AA men (for those unfamiliar - Automobile Association road scouts) saluted, cars had running boards and starting handles, the expression 'making love' was meant to indicate polite conversation and a gentleman would defend his lady's honour with his life (and take the lives of those threatening her harm without any qualms). 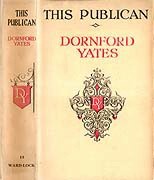 Within 'Dornford Yates' output were two separate series of books and well as several 'out of series' titles although some of the characters appear in both and in others outside the two series. The 'Berry' books tend to be light and humorous and the 'Chandos' books are adventure thrillers. with occasional appearances by Boy's American fiancée (and later wife), Adèle. Comment has been made about the parallel between the 'Boy' character and 'Dornford Yates' himself, both of whom were barristers and married to and then separated from an American but it was never admitted that the character was autobiographical. The Chandos Books include Richard (William) Chandos, with usually Jonathan Mansel and sometimes other characters including George Hanbury. Chandos and Hanbury, after their first adventure together, bought their country house of 'Maintenance', in Wiltshire. Many of the characters also appear singly or with others in the non-series novels either in cameo roles or as main characters but without their usual associates. The general atmosphere created by 'Yates' is one where every day was summer and England was green and welcoming. His novels are populated by 'ladies' and 'gentlemen' who were worshipped by their servants who, in turn, were regarded as part of the family but a very definitely hierarchical family. Nobody does much work other than Berry who sometimes disappears to chair the Magistrates' Bench, Boy who is occasionally involved in legal matters and Jonah whose absences are inferred to be on unspecified secret intelligence work. All are of independent means and it is easy to lose oneself in the idyll that he creates. The dustwrapper artwork of many of the UK editions of 'Dornford Yates' is rather attractive. The Hodder and Stoughton editions are difficult to attribute but the Ward Lock editions are a little easier. S. van Abbé, ARE, RBA* was responsible for a number of the earlier titles and J. F. Campbell for many later ones while they both produced a version of 'The Stolen March'. (*ARE-Associate, Royal Society of Painter-Etchers and Engravers, RBA-Royal Society of British Artists). The Dictionary of British Book Illustrators (Alan Horne) has very little to say about 'Abbey', (his name not being provided), other than the fact that he flourished 1919-1925 and was responsible for some early Herbert Jenkins dustwrappers of P. G. Wodehouse titles. We found rather more detail (including his name) in some Percy F. Westerman titles (pub. Blackie) where he received rather more in the way of acknowledgement. Horne provides only little more detail about John F. Campbell, giving his name rather than, in the case of van Abbé, an interpretation of his signature and that he flourished 1909-1930. We have also spotted his work on some Ward Lock 'Sanders' paperback titles of Edgar Wallace. The dustwrappers of the later titles were by various artists including Peter Rudland ('B-Berry and I Look Back' and 'Wife Apparent') and 'Val Biro' (Balint Stephen Biro - 'Lower than Vermin') who was also responsible for the second uniform edition dustwrapper. There were two series of uniform dustwrappers, the first issued from about 1943 to 1949 and the second from about 1950. Both are an armorial type of design, the first unattributed and the second by Val Biro and in our descriptions are called the '1st uniform' and the 'biro' designs respectively. Notes: Not published elsewhere, issue dated 25th May, 1910, authorship unattributed in the weekly issue, only attributed in the index of the bound volume for the half year. Synopsis: Characters: Boy, Daphne, Berry, Jonah and Jill, and fifteen beautiful young things that Boy comes across. (includes reference to Jim and Milly Hathaway '...among our greatest friends', never mentioned again in any Berry story?). Fifteen short stories set in Hampshire, Devon, Cotswolds, and Austria. Synopsis: Characters: Berry, Daphne, Boy Pleydell, Jonah and Jill Mansel, Sealyham 'Nobby', and a later appearance by Adèle, others include cousin Vandy Pleydell. Short stories, set at 'White Ladies', Hampshire in 1919. Includes civil action against roadhog, robbery of family silver and replacement, kidnap of Nobby and betrothal of Boy and Adele. Synopsis: Characters: Major Anthony Lyveden DSO, Valerie French, Sir Andrew Plague, Lady Harriet Touchstone, Andre Strongi'th'arm, Cardinal John Forest. Sequel to Anthony Lyveden in which Anthony has lost his memory and confuses his lovers. Minor characters: Hamlet (Patch, Anthony Lyveden's dog), Pvt Albert Rogers, Pvt. Hoskin, Col. Richard Winchester. Synopsis: Heroes: Richard Chandos (narrator), George Hanbury, Jonathan Mansel, with their respective servants, and 'Tester' the Sealyham, 'Rose' Noble, Jute (Hannibal Rouse), Casemate, Bunch and Punter. The kidnap of Adéle, by Rose Noble, whilst on holiday with Berry, Daphne and Boy at Poganec in Carinthia, Austria, 1927, held at the Castle of Gath near Lass while a ransom of half million is demanded from Mansel, and his near mortal wounding. Richard Chandos and George Hanbury now share a house called Maintenance in Wiltshire and hunt four days a week. Rowley is a non-driver. Synopsis: Characters: Richard Chandos (first person story), George Hanbury, Bell and Rowley, Grand Duches Leonie, Lord President Sully, Grimm, Duke Johnann, Major Grieg, Martin Eigge, Duke Paul, General Kneller, Lord in Waiting Brooch. Set mainly in the principality of Reichtenburg in Austria, the account of the aiding of Duke Paul to succeed on the death of the Prince despite the work of Grieg and Johann to prevent it in Johann's favour. Ends with Leonie joining Chandos at Maintenance. Hanbury's servant Rowley is now a driver. Chandos, aged 25, still lives with Hanbury at Maintenence but Hanbury moves out at end of story. Notes: Not issued in UK as in an omnibus edition. Synopsis: Characters: Richard Chandos (narrator), George Hanbury, Bell and Rowley, Marya Dresden (servant Carol), Grand Duches Leonie, Lord President Sully, Ramon, Lelia, Prince Paul, Major Grieg, Reubens (circus-master), unnamed Doctor and district coroner. Chandos and Leonie, now married, visit Austria near the border with Reichtenburg, from where Marya Dresden is due to join them. Prince Paul commissions Grieg to entice Leonie into Reichtenburg, uses Marya Dresden to bring Chandos and Hanbury (Marya's lover) into the country. Secret entry via smugglers route behind waterfall. Chandos and Hanbury join circus for part of route, account of the separate rescues of Marya and Leonie from Grieg/Prince Paul, and the death of Grieg. At end Hanbury and Marya Dresden intend marriage. Synopsis: Characters: John Spencer (narrator), his guardian the artist Geoffrey Bohun and Barley, his manservant, Lady Helena Yorick, Florin, Pharoah (Capt. Faning), Bugle, Rush, Dewdrop, Helena's brother Valentine, Count of Yorick. Set in Austria, Spencer witnesses the burial of a liveried servant, murdered after an attempt to sieze some gold in transit. Spencer identifies Lady Helena as the owner of the livery, warns her of murder, becomes her lover. Discovers the target is gold bullion in the cellar of her home, the castle at Yorick. Action is then the various attempts to steal the hidden bullion, the final elimination of the gang, and the reconciliation of the by then estranged lovers. Synopsis: Characters: Richard Chandos (narrator), Jonathan Mansel, Vanity Fair, Gaston (Count of Rachel), Jean, Lafone, Luis, Marc, Below, Acorn, Virginia Brooch, Jenny, Great Dane 'Goliath'. At the Chateau Jezreel in the south of France and Anise in the Dordogne. Defending the life and birthright of Jenny. 1936 Ward Lock 2nd imp. The later reprints of the same upper panel design had a different shield image (a wigged judge) at the spine. Synopsis: Characters: Richard Exon (narrator), Winter (his manservant), John Herrick, Lady Elizabeth Virgil (Countess of Brief), Harriet - Duchess of Whelp, 'Matthew Gering' (Rudolf Elbert Virgil), Ferdinand Virgil - Count of Brief, Percy Virgil, Elgar, Elsa. Brief, about 120 miles east of Innsbruck (Austria), Raven - a farm nearby and Tracery, the seat of the Duchess of Whelp, 35 miles from Innsbruck. Defending the life and birthright of Lady Elizabeth Virgil. 1937 Ward Lock 2nd issue dustwrapper. The first issue was identical without the 'First cheap edition' and volume number at the spine. Notes: First publication in Windsor magazine (month unknown). Published in paperback by Oxford University Press 1998 in a collection of short stories 'Twelve Tales of Murder', edited by Jack Adrian. Synopsis: Characters: Lord Elvin, David Bohun (his great nephew), John Galbraith Forsyth - (Elvin and David Bohun's solicitor), Rowena Bohun (aka Elma Baumer and Rowena Howard), Chater - a private detective, Helen Adair - a divorcee, Lady Persimmon (her mother), Punch and Belinda Leighton, George Bagot (Leighton's solicitor). An evil woman, employing murder to arrange a better idenitity, uses her looks and plausability to win the hearts and minds of all those she meets, and marries the unfortunately naive David Bohun as a stepping stone to better things. Synopsis: Characters: John Bagot (narrator), Richard Chandos, Jonathan Mansel, Lady Audrey Nuneham, Barabbas, Rev. Bellamy Plato ('Kingdom of Heaven'), Plato's chauffeur (unnamed), Bogy (in background). Barabbas, fence and controller of thieves, is foiled in a venture by George St. Omer. St. Omer, friend of our heroes is killed on Barabbas' orders. Our heroes then set out to even the score, at the Chateau of Midian. Synopsis: Characters: Jeremy Solon (narrator), George Laking, Jonathan Mansel, Katherine Scrope (Formosa), Conrad, Joseph, 'The Shepherd', Judas, Satan, Mangey, Digs, Larry, and Mabel. Formosa, carrier of stolen jewels for The Shepherd, wants to retire. Solon becomes Katherine's lover, can identify The Shepherd thus becoming a target for elimination which he avoids but at the cost of the kidnapping of Katherine. Solon and Laking join forces with Mansel to bring The Shepherd down and release the kidnapped Katherine. Main action across France, including 'The Wet Flag ', the waterfront and Seine at Rouen and the castle at Cardinal 'in the Heart of France', the home of her blind artist father. 1942 Ward Lock 2nd imp. Synopsis: Characters: Richard Chandos (narrator), George Hanbury, Jonathan Mansel (Bell, Rowley and Carson), Caroline, Duchess of Varvic (nee Herring), Cain and Biretta, Duke Saul of Varvic, James Belper Orion Forecast, Boney, Gulf, China (turncoat), Auger. Takes place shortly after the events of Blind Corner, set between Villach and Salzburg in Austria, revenge for the taking of the life of Caroline's lover, Maj. John Bowshot. Schloss Varvic, a hunting lodge (charnel house with tilting floor), Cain and Biretta's firm of solicitors, Worsted and Co., and the village of Beehive. 1945 Ward Lock 1st edn. Synopsis: Characters: Richard Chandos (narrator), Jonathan Mansel, John Bagot, Mona Lelong (The Stoat), Daniel Gedge (Auntie Emma), Brevet, Lousy, Punter, Baron Horace de Parol, Toby Rage, Jenny (Chandos' wife), Jill, Police Inspectors Goalby and Falcon. Chandos and Mansel interfere with a robbery at Biarritz (involving friend, Toby Rage, where the butler is shot dead). Gedge, the leader of the robbers, resolves to kill them. An action across France, mainly at Baron Horace's Chateau d'Arx and Petit Arx (connected by a natural cavern), but also at Rouen, Dieppe and Vendôme. 1946 Ward Lock 1st edn. 1947 Ward Lock 1st edn. 1949 Ward Lock 1st edn. 1950 Ward Lock 1st edn. 1952 Ward Lock 1st edn. Synopsis: Richard Chandos and his wife Jenny, with Jonathan Mansel as a guest staying with them, are the audience for an account related by Superintendent Falcon whilst he is investigating the murder of Lord St. Amont at the village of Ne'er-do-Well. Notes: The author's only crime investigation novel. Not generally classified as a 'Chandos' title but Richard Chandos is the narrator. The dustwrapper of the first edition exists in three different states. 1954 Ward Lock 1st edn. 1956 Ward Lock 1st edn. 1958 Ward Lock 1st edn. Notes: A nostalgic study of some recurrent characters in the romantic fiction of Dornford Yates, John Buchan and Sapper: revised edition published Barrie and Jenkins, 1974: paperback edn. published Hutchinson 1983. Notes: Memoirs of a chauffeur/motor engineer to King Edward VII 1905-10, with acknowledgement to Dornford Yates in the foreword 'but for whose tireless assistance these memories might never have been published', presumed ghost written by DY. Contains several references to Pau. Notes: An illustrated biography of Dornford Yates. A 2nd edition was published as trade paperback and marked Centenary Edition in 1985 with some corrections and no illustrations.